Anyway, I’m back and ready to talk about burgers. I’ve made a lot of burgers since Memorial Day (as one should, I think). I’ve done classic hamburgers, caprese turkey burgers, (recipe coming in my forthcoming book! 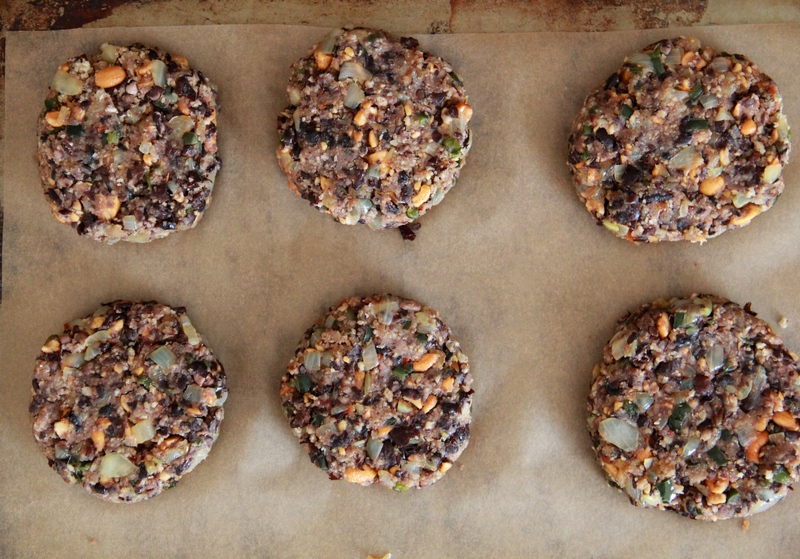 More on that soon…), lamb burgers and these roasted black bean burgers, which definitely hold their own in the category. These are my first go at homemade veggie burgers — I wanted to try my hand at making them because, though I’m definitely a meat eater (ahem, lamb burgers), lately I’ve been slanting towards a more veggie-centric diet in general, and sometimes I’m just not in the mood for meat (and lambs worldwide rejoice). Veggie burgers can be lackluster (at best), and I was worried about turning up a mushy, ambiguously-flavored patty, but Kenji at Serious Eats helped put my fears behind me. Roasting canned black beans (rinsed and drained, first) eliminates the mush-factor and intensifies the flavor of the burger, and adding sautéed onions, garlic, and poblanos, plus some chopped chipotle in adobo and a handful of roasted cashews, really brings the whole thing to another level. The resulting burger is deep and smoky, with a firm, slightly crumbly texture once cooked. You won’t miss the meat. 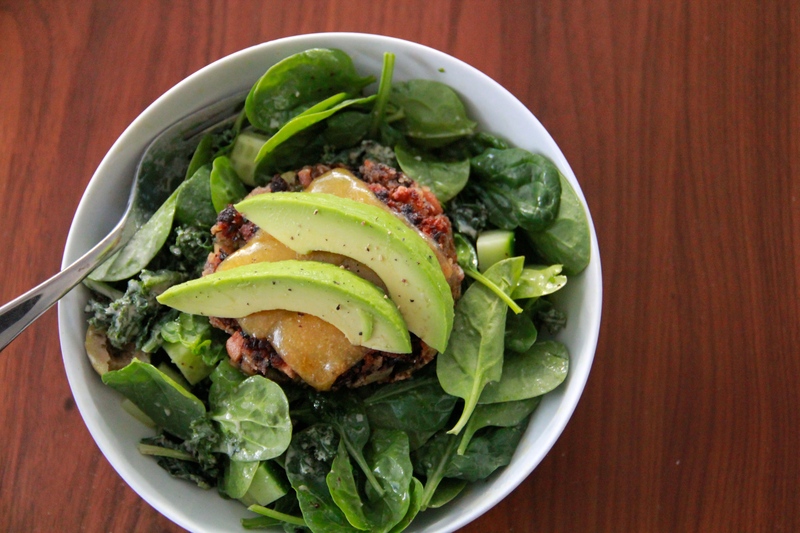 Pile it on a bun with all your favorite fixings, or eat it over a bowl of dressed greens with some rice or quinoa mixed in. Heat oven to 350 degrees. Line a sheet pan with foil, and spread the black beans out on top. Roast the beans for about 20 minutes, until they’ve started to split and seem pretty dry. Allow to cool. While the beans roast and cool, heat the coconut oil in a medium skillet over medium-high heat, then sauté the onion and poblano in the oil for 5-10 minutes, until soft and translucent. Season with some salt. Add the garlic and chipotle pepper with sauce and cook and additional minute. Transfer the onion mixture to a large bowl and set aside. In the bowl of a food processor, pulse the cashews into small pieces (about 12 pulses). Transfer the cashews into the bowl with the sautéed onions. Place the cooled beans in the empty food processor, and pulse the beans until roughly chopped, then transfer them to the bowl with the cashews and onion mixture. Add the mayonnaise, egg, panko, and some salt and pepper, and use clean hands to mix everything together. Form the mixture into 6 patties. At this point, the patties can be flash frozen on a baking sheet, then placed between layers of parchment and stored in an airtight container in the freezer. (Allow them to thaw at room temp for 1 hour before grilling, baking or sautéing). To grill, bake or sauté the burgers, first brush them with vegetable oil, and make sure to cook them over medium heat (high heat will cause the outsides to burn and the interiors to be raw) for about 5 minutes per side. Serve burgers hot, with plenty of your favorite toppings. Roasting the beans?? What a great idea. These sound delicious. 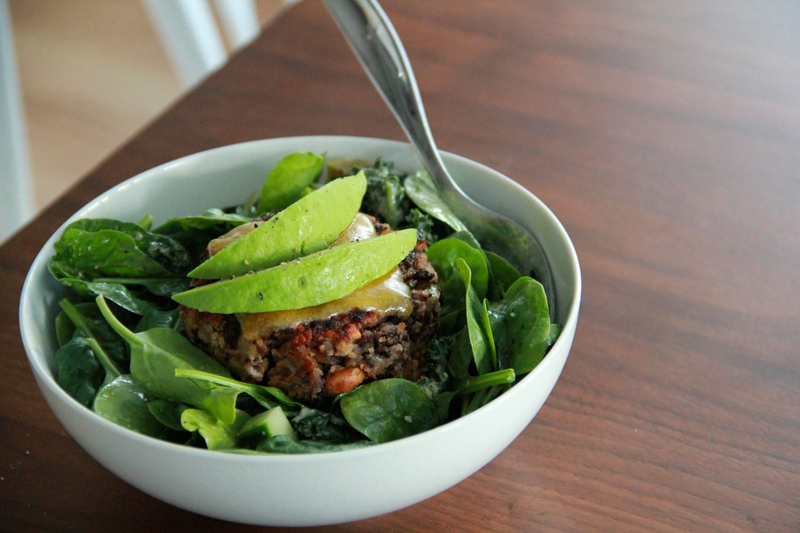 Am in love with bean burgers…will give this a try. Am sure mine will crumble but who cares!! !